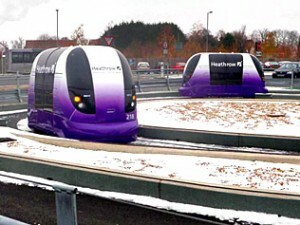 The future of public transport on an airport is here as laser-guided travel pods were unveiled at Heathrow Airport, UK. For the moment, the airport has a fleet of 21 such pods and these pods will take the passengers to their airplane with information from passengers frequent flyer cards or by typing their flight details into the computer. There will be no stops on the road. Apparently passengers have been thrilled by these pods – or so show the comments on Twitter, says an official of the Heathrow Airport.